All branches of MCPLS will be closed November 22-24 in observance of Thanksgiving! 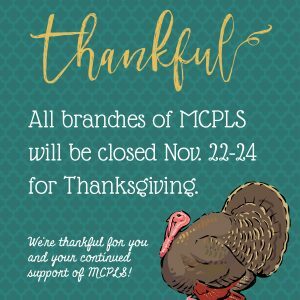 We’re thankful for you and your continued support of MCPLS! We may be closed until Monday, but our online services never close! Check out these fun online resources (in ABC order)! Follow the links below each resource (or download their apps) to get started! hoopla: eBooks, audiobooks, movies, TV shows, comics, and music– no wait!